Pahrump’s Marine Corps League Detachment 1199 is looking for a few good men, women and even children to view their new home this weekend. The detachment is holding a special service on Saturday at G.G. Sweet Memorial Park on Gamebird Road just west of Money on the valley’s south side. Capt. Joseph Lee De Guise, USMC (retired) expressed the detachment’s gratitude in having a permanent location for the Marine Corps League. 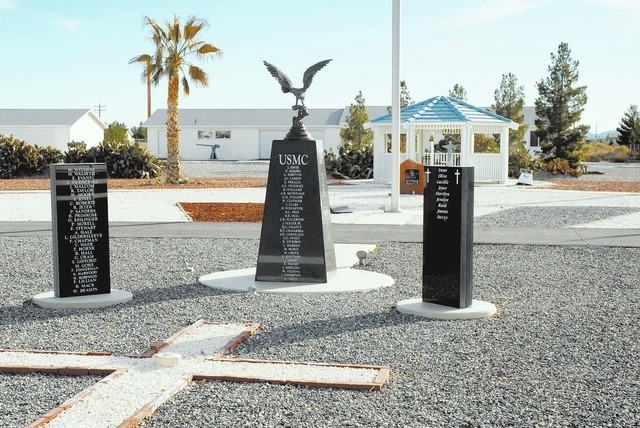 He said the site was the perfect venue for members of the Marine Corps League. “We used to use the space donated by Draft Picks, which was formally Wulfy’s and they provided the facilities for us for a number of years until we had the opportunity to move to G.G. Sweet Memorial Park. We meet the second Saturday once a month and this event will be the first meeting at our new location,” he said. The retired captain said the site has a number of amenities that reflect the history of the United States Military. “The meeting room is also a museum and we are going to give tours after the ceremony. There are captured weapons from World War II and the Korean conflict that are on display. There’s a lot of uniforms from the Korean War as well as books and original photographs of Captain Sweet and many of his associates in the Marine Corps. I do want to say that the museum is open only on special occasions. It’s not open on a regular basis. Anytime we have observances of a holiday or so forth, it’s open to the public,” he said. Museum artifacts aside, De Guise said there are a few features on the grounds that may be viewed by visitors. “It’s not closed up but there are people living on the property. The main site where the memorial is located has a walking area there. There’s also a naval gun in front of the museum that actually came off a battleship. 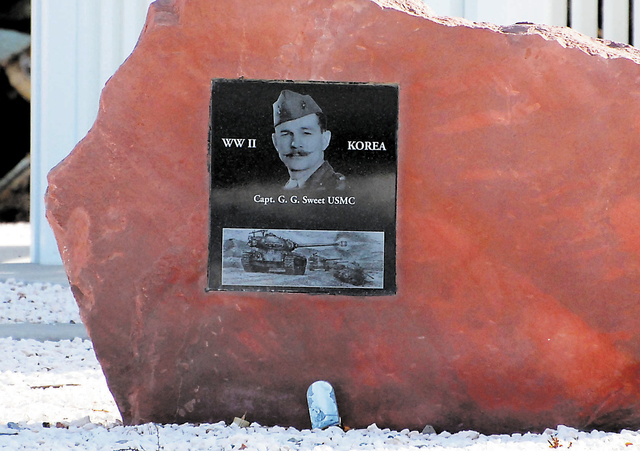 There are markers out there with the names of people who impacted Captain Sweet’s life at one time or another like some of his buddies from the Korean War. All branches of the military are represented there,” he said. Born Granville G. Sweet on July 16, 1917, he served as a Marine Corps gun captain aboard the battleship USS Nevada during the attack on Pearl Harbor in December 1941, sustaining multiple wounds after he was blown into the water. Sweet was treated at Bremerton Naval Hospital in Washington, where military officials wanted him out selling war bonds, but Sweet wasn’t ready to leave active duty. He was commissioned after World War II and eventually entered the tank corps where he commanded a tank platoon that decisively halted a North Korean attack at the first battle of the Naktong River west of Pusan, South Korea. After his military career Sweet started several successful businesses as a civilian, including a chain of McDonald’s restaurants, gas stations and warehouses. He created the memorial park that stands on the grounds of his home and has been the venue of yearly Memorial and Veterans Day events. He died in the summer of 2010 after suffering from poor health for several years. Sweet set up a trust fund to maintain the memorial park and museum in perpetuity. Saturday’s service will include a special unofficial flag folding ceremony for guests of honor, Major and Mrs. Roger U. Chaput, who served in the Marines alongside Sweet. The ceremony is scheduled for 2 p.m.